If you’re heading overseas, you’ll need more than a passport and a sturdy set of luggage. 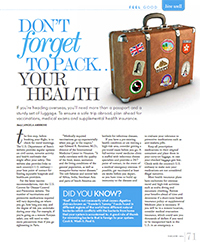 To ensure a safe trip abroad, plan ahead for vaccinations, medical exams and supplemental health insurance. The first step – before booking your flight – is to check for travel warnings. The U.S. Department of State’s website provides regular updates on civil unrest, terrorist activity and health outbreaks that may affect your safety. This website also provides links to each country’s U.S. embassy – your best point of contact for finding reputable hospitals and healthcare providers. For the latest vaccine recommendations, visit the U.S. Centers for Disease Control and Prevention website. The number of vaccinations and preventive medications required will vary depending on where you go, how long you stay, and the degree of risk you undertake during your trip. For example, if you’re going on a remote Kenyan safari, you will need to take more precautions than if you go sightseeing in Paris. “Medically required vaccinations go up exponentially when you get to the tropics,” says Edward R. Rensimer, M.D., International Medicine Center director in Houston. “It really correlates with the quality of the food and water, sanitation and the living conditions of the general population, as well as mosquito-borne vector diseases.” The sub-Saharan and central belt of Africa, India, Southeast Asia and parts of South America are hotbeds for infectious diseases, warns Rensimer. If you are elderly, have a pre-existing health condition or are visiting a high-risk area, consider getting a pre-travel exam before you go. A full-service travel medicine clinic is staffed with infectious disease specialists and provides a 24/7 point of contact, in the event of a medical emergency overseas. If possible, get vaccinated at least six weeks before you depart, so you have time to build up immunity to the diseases and to evaluate your tolerance to preventive medications such as anti-malaria pills. Keep all prescription medications in their original containers and place them in your carry-on luggage, in case your checked baggage is lost. Check with the country’s U.S. embassy to make sure your medications are not considered illegal narcotics. Most health insurance plans have exclusions for overseas travel and high-risk activities such as scuba diving and mountain climbing. Review your benefits ahead of time and determine if a short-term health insurance policy or supplemental Medicare plan is necessary. If you will be in a remote location, consider medical evacuation insurance, which could save you thousands of dollars if you need to be transported back to the U.S. in an emergency. Get vaccinated at least six weeks before you leave. Review your health insurance benefits and consider purchasing a short-term policy. Carry a medical alert card or bracelet indicating any serious health conditions or allergies and a list from your doctor of all prescription drugs with their generic equivalent names.